I live in Estes Park, Colorado. The beauty of the nature in and around the mountains I live in. I love making unique jewelry that reflects the colors of the Colorado Rocky Mountains. Bridal jewelry inspired this design. 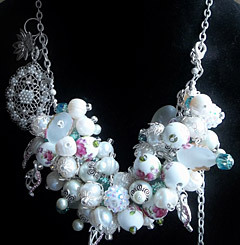 I love bib-style necklaces and sold this to a person to give to a bride.